On a bright autumn afternoon, I picked my way along four miles of overgrown and rusty railway track on decaying wooden sleepers, running through rural Fife along the banks of the River Ore.
Sleeper is the operative word. The Thornton to Levenmouth rail spur could deliver massive economic and environmental benefits for the whole of Scotland, serving Diageo’s world-leading distilling plant at Cameron Bridge, as well as Fife Council’s booming renewables industry park at Methil on the coast. 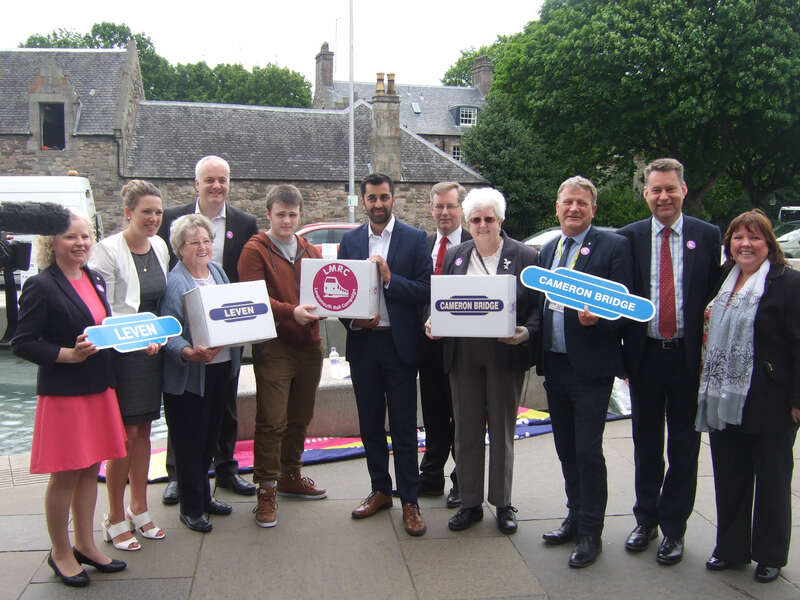 It could, eventually, give the people of Leven, Buckhaven and Windygates a proper rail connection with the rest of Fife, Edinburgh and beyond. More controversially, it could be used to transport coal from new open-cast coal sites to a modernised clean-coal Scottish power station using carbon capture technology. Almost everyone agrees that this four-mile stretch of railway line should be reopened, so why have there been years of procrastination? Last week, I left my car near Thornton Golf Club, walked parallel to the Fife mainline embankment, going under a Victorian brick rail bridge at Lochty Bank. From there I picked up the spur, and saw that while the railway bed was still intact, it had reverted to a scenic wilderness with elder and hawthorn trees sprouting from the stony track – another of Scotland’s lost economic lifelines. This section, owned by Network Rail, traverses several disused level crossings as it runs parallel to the River Ore through lush woodlands, crossing the Ore on a rusting iron bridge, then through a tranquil corridor, past a tall red brick embankment, arriving at Windygates, next door to Cameron Bridge. There are no tunnels on this stretch. The line closed for passengers in 1969 but was used for hauling coal until 2001. The old track is still intact but looks unsuitable for modern use, so new track, signalling and sidings will be required. A trial freight train to Diageo’s plant several years ago prompted no follow-up traffic, so Network Rail no longer maintains the line in operational condition – except for a small section to Earlseat open-cast coal site. But the line could effectively be extended to Methil docks where it could serve the 134-acre Energy Park Fife which Scottish Enterprise and Fife Council say is a “state-of-the-art hub for the renewable energy sector that aims to turn Fife into a world-leading centre for developing renewable energy technologies”. Given the importance of creating the connected economic networks laid out in this year’s National Renewables Infrastructure Plan (NRIP) as essential for supporting the nation’s offshore wind dreams, this hub for low-carbon marine energy and potential engineering hothouse could surely use a railway terminal. The crux of the issue is that Transport Scotland has already undertaken its Strategic Transport Projects Review which has defined the investments in Scotland’s national transport network from 2012. The Fife spur has never been on the list because there were other priorities, many of which are easy to present as more pressing. Strategic projects such as the reopening of the £85 million Stirling, Alloa, Kincardine line are already delivering massive freight and passenger benefits. But there is now a view that Transport Scotland could reassess the line’s future in the light of major developments. Recently, investors and funders gathered in Edinburgh to talk about Scotland’s low carbon future and how to exploit our offshore wind assets. There was talk about the funding of improved infrastructure, the central point of the recent conference. The estimated cost of reopening the line is £40 to £48m, depending on the state of the bridge. A figure of £10m a mile is a rough rule of thumb, although Transport Scotland said that an average for railways depends on a number of factors including topography, purchase of land and rebuilding of tunnels and bridges. Scottish Enterprise and Fife Council have ambitious plans for Methil and have invested more than £10m in the first phase of development to improve access to the site. Scottish Enterprise’s board approved more than £13m of funding for phase two in August 2009. Phase two is already looking at extensive work to upgrade the quaysides as well as coastal defence work. We’re told the investment will help Scotland secure a significant share of the UK offshore wind market, estimated to be worth £19 billion, and have the potential of creating more than 800 jobs. But Fife’s coastal roads are hardly designed to service a brand new heavy industry, constructing and servicing structures up to 100 metres high. A railway link must surely be part of the plan. But there is another more strategic global company with a strong Scottish presence involved. The Sunday Herald in 2005 labelled Diageo “the filthiest company in Scotland” because of the by-product effluent that it poured into the local river and the Firth of Forth. To its credit, Diageo has taken on board this unwanted moniker and has changed radically. Its commitment to being a socially responsible business means it is endeavouring to cut its carbon footprint. Its new biomass plant, being completed at Cameron Bridge, is saving carbon-dioxide emission, taking the equivalent of 44,000 cars a year off the road. Paul Walsh, chief executive, said Diageo’s plans for Scotland, where it had invested in six new whisky bonds, a £10m cooperage and a £110m grain distillery at Cameron Bridge, include its new £40m water treatment plant. “It’s the biggest investment in water treatment by a non-utility and the second biggest plant in Europe. It’s a once-in-a-lifetime opportunity to build a real world-class footprint in Scotland,” he told the Sunday Herald. Diageo, which is in the controversial process of transferring the production of Johnnie Walker – the world’s number one whisky – to Fife, produces about 100 million litres of spirits at the Cameron Bridge site each year. This includes white spirit for Gordon’s and Tanqueray gin and Captain Morgan rum. Diageo’s recent withdrawal from Kilmarnock means that Fife has now become even more important for Scotland’s economy. And the world’s biggest whisky producer has immense strategic significance because Scotch whisky can only be made in Scotland. The Malcolm Group, one of Scotland’s leading logistics companies, already transports much of the bottled spirit produced in Leven. In 2002, the Malcolm Group invested £3m in building its freight rail terminal at Fouldubs junction at Grangemouth, which takes more than 10,000 lorry journeys a year off the motorways. Freight trains carrying whisky run from Grangemouth to Crick, near Rugby, cutting down on pollution. The Malcolm Group is keen to see if the Fife line could be reopened for freight at Cameron Bridge. Diageo says it remains keen on the idea and is willing to put £3m into a pilot project, but with nothing happening it began to look at a rail terminal at Thornton. The cost of this would have been prohibitive, and still required lorry transportation, so it has returned to Fife Council to re-examine the project. Such a rail link might alleviate the heavy articulated lorry transport on the Forth Road Bridge that has done so much to shorten that structure’s life. Currently, a mighty 20% of Scotland’s wheat harvest is driven on rubber and tarmac to Cameron Bridge. The gains to be had by getting cereals, bottles and the spirit moving on the rails once again are massive. SESTRAN, the South East of Scotland Partnership, one of seven “regional transport partnerships” in Scotland, meets in Edinburgh this week and has a hit list of projects to consider. It promotes the reopening of passenger lines and has strong support from Fife Council for reconfiguring the Fife Circle. However, with the priority remaining the Forth Replacement Crossing and the Edinburgh-Glasgow Rail Improvement Programme, the view taken by £2bn-a-year-spending Transport Scotland, whose credentials as a pan-Scottish strategic brain have still to be convincingly established five years after its formation, is that reopening to Levenmouth will only be a “local” priority – therefore the capital budget expenditure for this must come from Fife Council. As a contractor to Transport Scotland, franchise holder ScotRail would be advised as required on how the Fife Circle might best be reconfigured to serve Levenmouth, but the final decision rests on the ponderous internal processes of Transport Scotland. Transport Scotland says that it could be interested if there was a local sponsor for the project. This smacks the ball firmly back into the court of cash-strapped Fife Council. Councillor Tony Martin, chair of Fife’s environment, enterprise & transportation committee would like to see the spur extended down to Methil docks where it can be used to service the renewable industry. 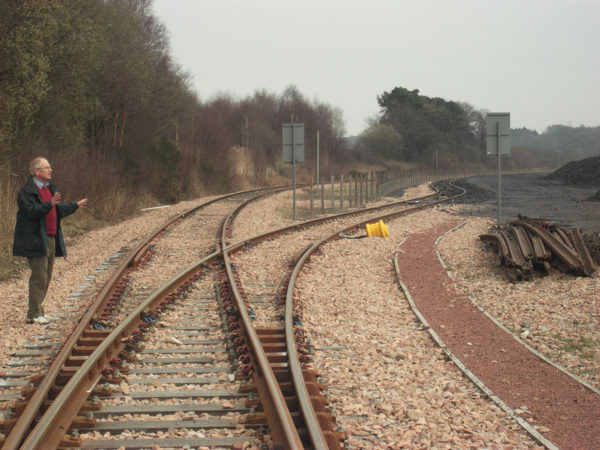 Network Rail, which undertakes railway work on behalf of the Scottish Government, says it will not undertake any new track work unless there is proof of commercial demand, a familiar hurdle to transformational infrastructure. In February 2009, Network Rail initiated the Short Term Network Change Procedure to temporarily close the line, as the line had not been used in more than five years. This occurred in May 2009. So meanwhile, the existing track is not being maintained and is gradually deteriorating beyond redemption for modern use. The aggressively encroaching undergrowth of rural Fife looks set to be the only winner.